Extract the ZIP file you downloaded to the training/middleware/ folder. A description of the files and folders found in this ZIP file can be found here. You will develop the lab under this folder. The MPLAB X IDE will create a sub-folder named emwin_media_player_lab inside the dev/emwin_media_player folder. Start the MPLAB X IDE and create a New Project by selecting File > New Project. In the Categories pane of the New Project dialog, select Microchip Embedded. 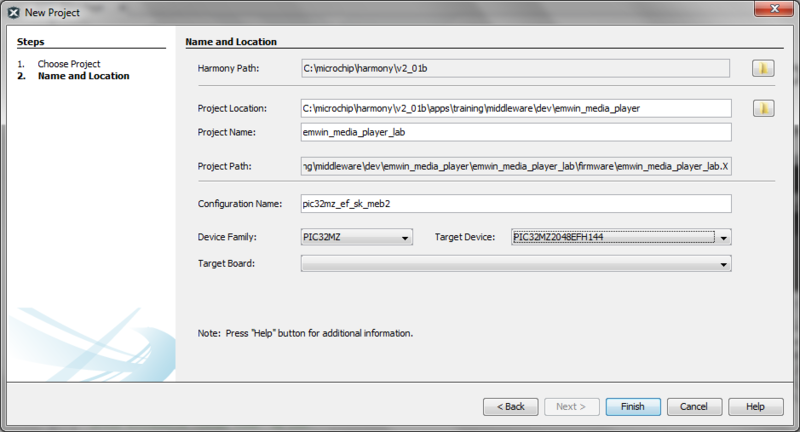 In the Projects pane, select 32-bit MPLAB Harmony Project, and then click Next >. 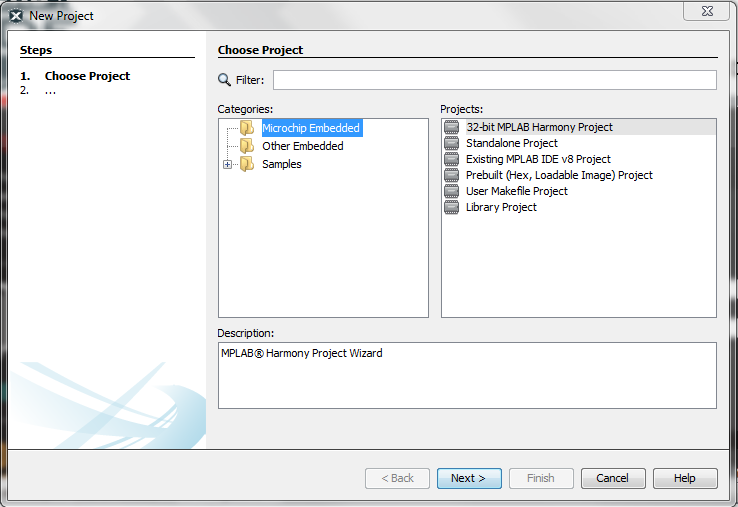 Click on the Options tab in the MPLAB Harmony Configurator main window to Select and Configure the Harmony Framework in a graphical tree-based format. If a Board Support Package exists for your development board you will want to use it. Choosing a BSP lets the MPLAB Harmony Configurator (MHC) know about the hardware you will use for the project. In addition to configuring hardware options for you, the BSP comes with a small group of library functions that allow you to more easily interface with LEDs and switches. In this lab, you will observe the selections the BSP makes for you. This will show you how to make these selections manually in case a BSP does not exist for the board you want to use. 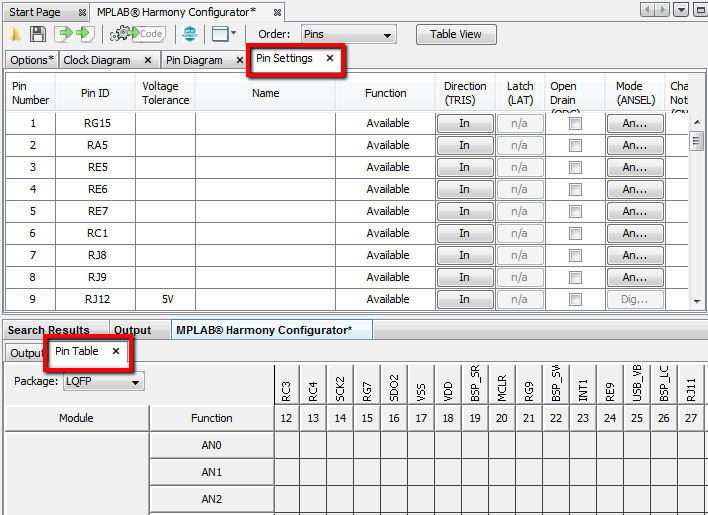 In the central window under the MPLAB Harmony Configurator tab, click on the Options sub-tab, to view the MPLAB Harmony & Application Configuration tree selections. Expand the Device & Project Configuration tree then expand the PIC32MZ2048EFH144 Device Configuration. In case you are wondering where these cryptic selection names come from, they correspond with the PIC32 core configuration registers and bit names. Please see the device data sheet for details. Before moving to the next step, you may want to collapse the Device & Project Configuration tree. The PIC32 is connected to a 24 MHz external clock input. You are not using the internal PIC32 oscillator. When you change the configured clocks away from the default values on the graphical interface, they are reflected as a shaded field in the Options Configuration Bits. Since the BSP selected the default values, there should be no shading. To illustrate this, notice when the FPLL DIV is changed to a Divide By 1 instead of 3 in the CLOCK DIAGRAM graphical interface, the OPTIONS tab will reflect the changes in DEVCFG1 with Shading. You can configure the clocks using the tree selections, but it is much easier to do graphically! The BSP has already configured the PLL using the selections for the "PIC32MZ EF Starter kit \w Multimedia Expansion Board II". For custom boards without a BSP, you can use the PLL’s “Auto Calculate” feature to determine and set the PLL multiply and divide values (FPLLIDIV, FPLLMULT and FPLLODIV). You can see how this works by going back to the Clock Configurator window (Clock Diagram tab). This development board can run at a maximum frequency of 200 MHz (selected by default by the BSP). You are using the audio CODEC on the board, so you need to configure the system frequency to 198 MHz. The reason for this specific frequency is described in the "Configure Audio CODEC" step. Open the Graphical Pin Manager by clicking on the Pin Diagram tab. Verify the Board Support Package (BSP, selected in a previous step above) has properly configured the PIC32 pins based on the external devices connected to them. You will be using the Audio CODEC AK4953, LCD Display, LEDs and Switches. Select the “Pin Table” tab in the MHC output pane and the "Pin Settings" tab (see the following screen-shot). If this window is minimized, it can be found on the bottom left part of the MPLAB X IDE. Click on it to maximize it. Notice that PINs 43, 44, 45, 67 and 84 have LED_n selected on them. Notice that PINs 59, 60, 61 and 22 have Switch_n selected on them. Notice that the PIN 46 has Power down enable/disable for the CODEC AK4953 selected on it.